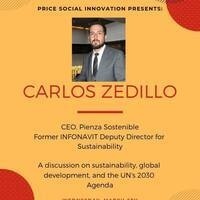 Carlos Zedillo is the CEO of Pienza Sostenible and StudioZV and was formerly the Director of Sustainable Development for INFONAVIT in Mexico. On Wednesday, March 6th at 6PM in RGL 100 he will be discussing his research and experience on the current situation and progress of the UN Agenda 2030 for Sustainable Development (with a focus on the 17 SDGs) in Mexico and in the world, and how it relates to public, private and civil society organizations. Mr. Zedillo will present his argument that sustainability is the only way to conceive of global development, and this requires a balance between responsible economic growth, equality and inclusion within communities, and development that avoids endangering the environment. Mr. Zedillo was the recipient of the 2018 Dubai Prize, has co-authored more than 40 publications, and is responsible for over 1,200 innovation and sustainability projects. He has previously taught at Yale University, the University of Pennsylvania, and Anahuac University in Mexico City. He has also been a guest critic for the Harvard University Graduate School of Design and the University of Michigan.